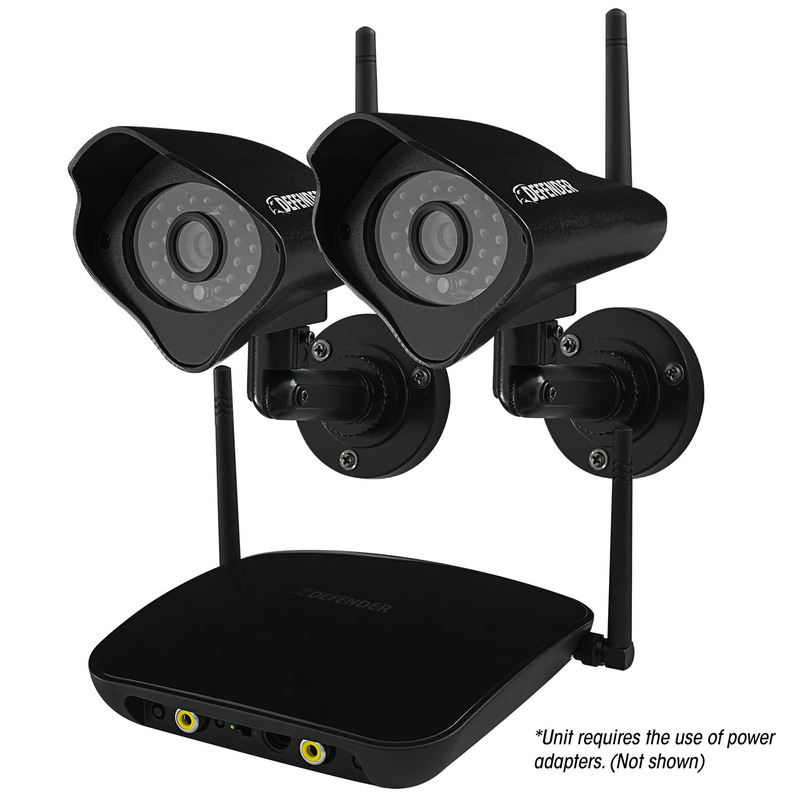 Defender® Wireless Security System can be used to monitor video in any indoor or outdoor space at any time of the day. This wireless plug and play system allows for easy set up. The wireless, weather resistant cameras included with this system have 24 infrared LEDs that allow you to see up to 75ft in the dark. Ideal for monitoring what matters most. ClearVu™ digital wireless technology makes set-up hassle free. This advanced system automatically connects when turned on – no wiring required. Superior digital functionality ensures that the signals remain strong as you monitor your business or home wirelessly, up to 450ft away. See it all in pristine detail, day or night: 520 TVL cameras with 75ft night vision leave nothing to the imagination. The indoor/outdoor camera provides you with a clear, secure picture, even when you monitor after-hours in a dark location. The camera comes equipped with advanced night vision that let you see clearly in the dark, up to 75ft away! The LED activates automatically when it gets dark. Defender®’s free 1 Step™ Remote Viewing software instantly networks your DVR with the Internet. View your video feeds live, receive instant email alerts and watch any previously recorded footage from anywhere in the world with an Internet connection on your smartphone, tablet or computer. The included 500GB HDD allows for continuous monitoring and can store over two years’ worth of recorded footage. Maximize available memory with motion activated recording and H.264 compression technology. DVR alerts will activate to notify user when HDD is full. Back up and transfer footage to USB flash drive or external hard drive via USB port. Only models from serial number 150401013 forward will have the color coding located on the back of the DVR. Optimum range is 150 feet when signal is passing through walls or floors. Microwave ovens (when in use) may cause signal disruption at close range. Buildings with metal frames may also cause signal disruption. Maximum transmission range is 450ft. DEFENDER® does not endorse any DEFENDER® products for illegal activities. DEFENDER® is not responsible or liable in any way for any damage, vandalism, theft or any other action that may occur while a DEFENDER® product is in use by the purchaser. We reserve the right to change models, configuration, or specifications without notice or liability. Product may not be exactly as shown. ©2013 DEFENDER®. All rights reserved. DEFENDER®, the DEFENDER® logo and other DEFENDER® marks may be registered. All other Trademarks are the property of their respective owners. I have had two prior security systems and the Defender System is far superior to those. Easy to install, plus if you happen to run into any difficulties, they respond quickly to resolve the issue. Great Company. love this system . i have 2 defender systems and turned on many friends to them. Michelle in tech support is the best !! The system advertises 150' from receiver to camera for optium picture quality. I have to differ with that, from my camera to receiver, I lose my signal constantly on two of my cameras, and they're mounted 13' up on the gabal ends, and receivers I had to mount seven feet from the floor towards the ceiling to get any reception. One camera is within 30 lineal feet and I vary from one to two bars of reception. The manual, and my sales man at Home Depot stated I will have no problem if the cameras and receivers are with 150' linear feet from each other. Boy, they were way off with the linear footage for an optimum picture. The picture quality is very poor, the furthest camera is 63' away from the receiver and both mounted as high as possible. The picture still jumps, such as i second apart just like still shots; again, I believe it is because of the range. I wish they had more power or an antenna extension to boost the reception, and the signal at the camera. I believe larger antenna's on both ends just might clear up this major operation defect. The setup program was very easy to navigate through online, and they're videos are very useful, well done, informative, and easy to follow through Defenders website.